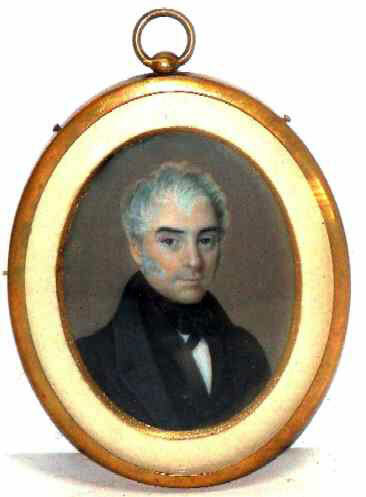 Presented here, a wonderful American miniature portrait on ivory of a very handsome gentleman by the name of William Crews. He is most handsome with the most compelling dark brown eyes. A hint of a smile plays about his lips and he looks directly at the artist with a kind look upon his face. The sitter of this portrait is identified on a paper label on the reverse as William Crews along with the information that he died in 1860 at age 83 and that the portrait was painted by Fanny (Frances) Crews. 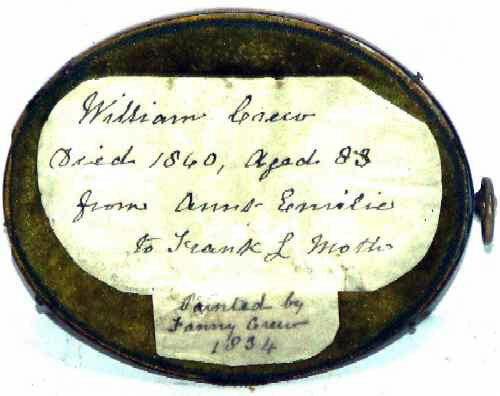 The miniature was given to Frank L. Moth by Aunt Emilie. Frank Moth was born 16 MAR 1872 in Farmville, Prince Edward, Virginia and in doing research on William Crews we believe he was from Virginia also. The oval, gilt brass frame measures 2-5/8" x 3-1/4", plus the hanger. The sight size is 1-3/4" x 2-3/8". The color, preservation and the manner of execution are all excellent and it is in excellent condition.